Driverless technology has become a new trend in the development of automobiles. Many automobile companies are competing for the market for driverless cars. It seems that it is getting closer and closer to us. However, what is the social acceptance of driverless cars and what are the ethical issues facing them in engineering? Who will be responsible for accidents caused by driverless cars? What impact will it have on society? All these are worth our consideration and discussion. Safety is the biggest advantage of driverless cars. The safety of driverless technology is far greater than that of manual driving. As can be seen from table 1, more than 40% of accidents are caused by operator’s mistakes, including drinking and fatigued driving. Self-driving technology fundamentally solves this problem, which means that popularization of self-driving technology can reduce traffic accidents by at least 40 percent. In the judgment of utilitarianism, this technology is of great value. In addition, according to Kant, anyone has the right to protect himself from harm unless he consciously and freely does something to be punished or chooses to take risks. The survey shows that after understanding the safety of driverless technology, the public has greater confidence in the popularity of driverless cars (According to a hit survey in Australia). The popularity of self-driving technology has a high commercial and social value, which means that we need to set more norms for it. 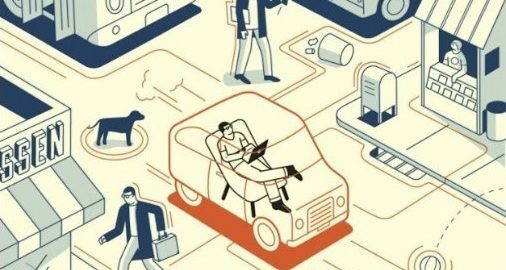 How can we set norms so that driverless cars technology can benefit human beings? This is the problem we have to face. Although driverless driving can bring many benefits (safer, more efficient,etc. ), maintaining the stable functioning of the social system is far more important than improving productivity in the current social structure and productivity levels. Last year, in Arizona, Uber’s self-driving car carcollided with a pedestrian crossing the road, causing pedestrian death. The first accidental death of a driverless driver triggered public concerns and doubts about the technology of driverless driving. The current discussion about the ethical dilemma of autonomous vehicles is mainly related to the famous “tram puzzle” in moral philosophy. “Tram problem” is a famous thought experiment proposed by the philosopher Philippa Foot in 1967 for criticizing utilitarianism. In the next few decades, moral philosophers have developed a number of variants. And if an automated vehicle is also facing an unavoidable traffic accident, who will the AI system choose to crash into? Should the “moral algorithm” of self-driving cars be based on the principle of reducing death or protecting the owner? This poses an ethical challenge to the algorithm of automated vehicles. Faced with this ethical dilemma, the Massachusetts Institute of Technology (MIT) Media Lab launched a website called “Ethical Machines” to collect data on situational choices for the public in the form of questionnaires. This moral machine has collected 11 million scenes answers. The MIT team pointed out that participants from the western region of the United States pay more attention to reducing the number of casualties value, that is, compared to the east, they agree more utilitarian choice. This means that the setting of “moral algorithms” must also consider the influence of moral-cultural pluralism. For romantics, driving doesn’t just mean taking control of a mechanical tool. They insist that driving brings freedom, power and even creativity.when you hold the steering wheel, you think you can go anywhere in the world.They fall in love with the pleasure of operating a car. But now they believe that self-driving cars threaten the fun of driving and eliminates the original car experience. Kant’s Theory/deontology allows us to look at this change from our own point of view, I don’t drive, but I worry that in the future, our children will no longer appreciate the wildness and grandeur of the racing race, and when they get used to setting their destinations before getting on the car, they also lose peaceful and quiet time of a man driving a car, loitering aimlessly. Also, as virtue ethics states that people should be encouraged to develop good or desirable characteristics. Don’t we need to take care of the nostalgia of a large number of consumers? The problems faced by driverless technology, although likely to slow the development of autonomous vehicles, we still believe that autonomous cars will be accepted by people in the next three decades. An interesting treatment of this issue. Driverless cars is a hot topic and there are a number of advantages to adopting them, such as the reduction in accidents, which can be approved via utilitarianism and deontology – as you stated. Your argument against illustrated that many people derive pleasure from driving, but this seems case specific. The idea of setting off on holiday is more apealling than the daily commute. The argument against needs additional ethical support. 327. I totally agree with the opinions in this article that this brand-new technology is definitely revolutionary and will increase the efficiency of transportation significantly with the aid of computer technologies which will select the best route considering factors like traveling time and traffic conditions. However it is still far from practice since most of drivers suspect the reliability of self-driving technology, many just enjoy driving by themselves. Furthermore the perfection of this new technology must be carried on in order to solve the security and safety issues and increase its reliability. The legislation and ethic issues also need to be considered to eliminate the negative impact on employment and society. I think it is better to gives some figures to help demonstration, for example the numbers of taxi and bus drivers that will be influenced by the technology, and also it is worth to discuss the impact of this technology on the economic side. Great article and thought provoking. Would love to see how this will come to play though. Technological advancement is very important in human life and everyday activities but its scary the way robots and machines are being replaced with humans. Personally I would love to drive myself. In my opinion, I would not think it is a deciding factor considered that whose the responsibility is when there is an accident. Drivers are not only for driving but also serving the passengers, drivers can deal with unexpected problem such as disabled passengers, passengers with alcohol or sudden illness. fully self-driving cars are very likely to be introduced globally, but maybe only for part of the traffic line, there is still long way to go when software can really achieve what a driver can achieve. A really well thought out article regarding ethics surrounding autonomous vehicles. I have a comment about the regulations of the algorithms used for them. Will the code be the same for each car? Will it be a universal code and government implemented or enforced by law? Or will there be variation between companies or even countries? If not, incidents that may arise that are associated with the code for a particular companies may cause them to have worse sales. It may be that there should be a law enforced regarding the situations in which you should save the occupants or save the other road users? It is a great article which both side have some good example to support their view. However, I think the against side can elaborate a bit more about the responsibility and highlighting the core problem which cause the responsibility confusion. For the agree side, the statements are pretty good and convincing. I believe that the formation of ethical problems caused by traffic accidents is an immature performance of autonomous driving technology. However, as autonomous driving technology continues to evolve, it brings more and more convenience to people and it will cause less and less trouble for people. Therefore, I think that from the perspective of utilitarianism, autonomous driving should be developed.